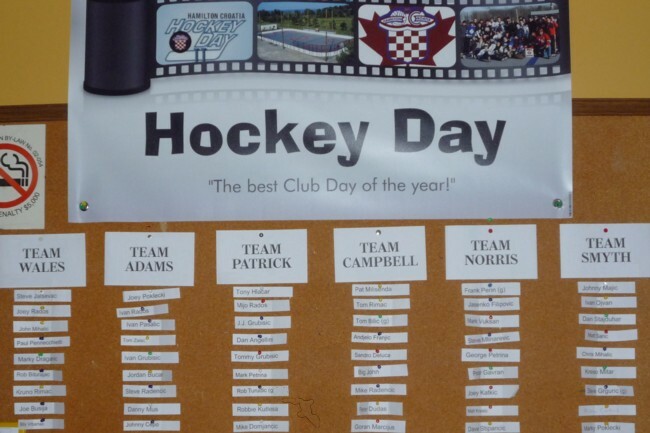 Frank Perin — For the second consecutive year Hamilton Croatia hosted Hockey Day on the third Sunday in February. In 2010 there were 40 total players split into four teams. This time around it grew to over 60 participants on six teams. Games were once again played at the Outdoor Ball Hockey Arena at Fifty Point Conservation in a round-robin format, followed by playoffs. Following the tournament the boys got together for some dinner and drinks while enjoying the Habs-Flames NHL Heritage Classic at The Club. in 2010 the ball hockey tournament was followed up by the Canada-USA round-robin Olympic game. The fun began with the annual draft of players on the Friday prior to Sunday’s tournament. Six goalies and close to 60 players were randomly selected to create six teams. Team Wales (White Jerseys): Steve Jalsevac; Joey Rados; John Mihalic; Paul Pennecchietti; Marky Draganic; Rob Biturajac; Kruno Rimac; Joe Busija; Billy Vrbanac; Johnnie Benko (g). Team Adams (Red Jerseys): Joey Poklecki; Ivan Rados; Ivan Pasalic; Tom Zalac; Ivan Grubisic; Jordan Bucar; Steve Radencic; Danny Mus; Johnny Cepo; Mike Jurincic (g); Pete Rados. Team Patrick (Black Jerseys): Tony Hlacar; Mijo Rados; J.J. Grubisic; Dan Angellini; Tommy Grubisic; Mark Petrina; Rob Turudic (g); Robbie Kutlesa; Mike Domjancic; Nick Petrina. Team Campbell (Blue Jerseys): Pat Milisenda; Tom Rimac; Tom Bilic (g); Andjelo Franjic; Big John; Mike Radencic; Peter Dudas; Goran Marcijus; Frank Vusir; Danny Ribaric; Steve Jurincic. Team Norris (White Jerseys): Frank Perin (g); Jasenko Filipovic; Mark Vuksan; Steve Mlinarevic; George Petrina; Petar Gavran; Joey Katkic; Matt Krasic; Dave Stipancic; John Poklecki; Gurram Subbash. Team Smythe (Black Jerseys): Johnny Majic; Ivan Ojvan; Dan Stajduhar; Matt Saric; Chris Mihalic; Kreso Mitar; Steve Grguric (g); Marco Cortina; Jason Krlin; Greg Zdelar; Mike Moravac. 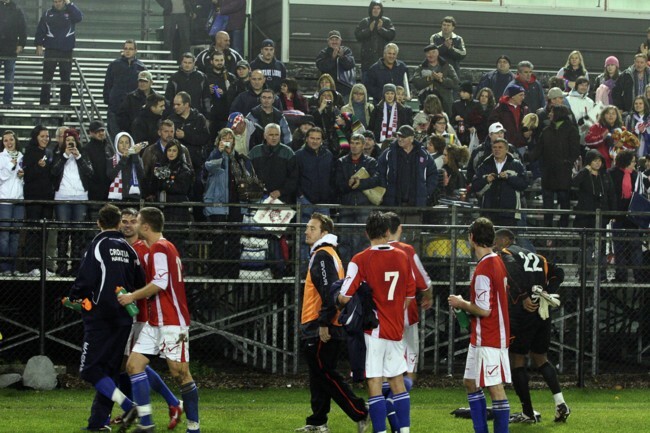 Hamilton players leave the field after beating Toronto Croatia in their final home game last season. HAMILTON, ON. — After an extremely successful first season in the Canadian Soccer League in 2010, Hamilton Croatia is pulling out of the semi-professional league. The final decision came following a lengthy meeting of the Hamilton Croatia executive board on Wednesday night. Board members came to the conclusion after hours of discussion and cite the reason for leaving as philosophical differences with the CSL. The time has come to revisit what is in the best interest of our club. The club would like to thank all of the fans, players, and staff for their continued hard work and dedication in making Hamilton Croatia what it is today. The team’s website will remain in tact, however, the url has changed to http://ateam.hamiltoncroatia.com. The organization has an exciting year ahead and will refocus its efforts on many different fronts including the hosting of the Croatian National Soccer Federation of Canada and the USA’s 2011 Annual Soccer Tournament on Labour Day weekend in September. For more details on our plans going forward, all our members can join us at our Annual General Meeting in a few weeks time.